Ornamental and shade trees add value to any home. However, the tree roots are often the last thing people consider before planting or digging near a tree. Many people have damaged their beautiful trees by improper placement of retaining walls, cutting roots for drainage lines, or even smothering roots with too much added topsoil. 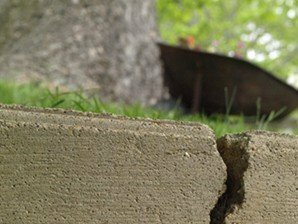 Costly damaged to foundations and basement walls also occur from building too close to large trees. The photo above shows a damaged retaining wall caused by roots from the tree eight feet away. Damage could have been avoided had the wall been placed farther away from the tree. This page will give you a picture of root growth and what to avoid. Myth #1: All trees have taproots. Tree root growth is largely misunderstood. Many people believe trees have is a carrot type taproot structure. This taproot secures the tree and has several smaller roots branching off from it laterally. Actual root growth is very much different from this. It is true that small saplings do begin with a taproot that helps anchor the tree into the ground. However, as the tree grows, the small taproot becomes non-functional and is replaced by a complex growth of lateral roots. These lateral roots can extend outward at least two or three times the radius of the canopy. This is important to keep in mind. If the radius (half of the diameter) of the tree canopy is twenty feet, the roots can easily extend out as far as sixty feet. This provides a tremendous anchoring system for the tree. The above photo shows a surface root from a tree several feet away. Certain trees are more prone to developing surface roots than others. The roots should not be removed unless they are causing a problem since these larger roots transport and store nutrients. Care should be taken not to damage them with the mower or trimmer. Types of Roots and Where They are Located? Roots don’t actually seek out water, as many people believe. Instead, roots will naturally grow whenever conditions are favorable. Small feeder roots gather nutrients from the soil. These feeder roots are very delicate and can be as thin as a hair. Large trees will have many thousands of them especially around the drip line. If they are growing in an area with sufficient oxygen, water, nutrients and warmth, they will flourish. If conditions change and are less favorable, the feeder roots will die back. About 75% of the tree’s roots will be in the top 10 to 18 inches of soil, while nearly 100% of the tree’s roots will be in the top three feet of soil. Myth #2: There is no harm in cutting tree roots. The truth is that damage to the tree will depend on several factors. Note: There is more at stake than just cutting roots. By cutting too close to the truck you can lose all the stability those roots provided. If the remaining roots are diseased, restricted, or damaged from grading or digging etc. the tree could topple. Always consult an arborist before any major projects begin around trees. Trees are not passive victims and will respond to damage in several ways. The health of the tree can influence how quickly the tree responds. Cutting through a few roots may not be noticed. Trees will attempt to replace roots but can be a slow process. They can also compensate for cut roots and the sudden loss of nutrients by sealing off branches and causing them to die back. Healthy trees respond best, while very unhealthy trees may die. Still, there are many reasons why people will need to cut through roots. Building a retaining wall, trenching the ground to lay drainage pipe, home basement construction, adding a septic tank, are just a few. Certain tree conditions are clues to the tree’s health and stability. Some conditions are more apparent than others. If the tree has large cavities in the trunk, this is usually an indication of previous damage, disease or both. Mushrooms growing on the sides of trees are indication of internal rot and decay. These mushrooms, called conks, are the fruiting bodies of internal decaying fungal diseases. Specific mushrooms growing on the ground near the base can be indications of diseases and decay in the roots. Digging around the roots and examining the tissue will confirm root diseases. Other things that would warrant concern is the presence of large dead limbs in the tree. 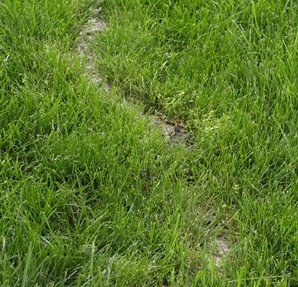 This could be an indication disease, root problems, insect or structural damage. Large patches of missing bark on the trunk or on larger limbs are often evidence of insect damage and/or disease. All conditions that indicate major health issues need to be considered. You don’t want to make a problem worse by hiring someone to cut around a tree when the person has no idea how it will ultimately affect it. Any Root cuts need to be cut cleanly and smoothly. Clean cuts will heal more quickly. Jagged cuts, like cuts from a backhoe or bulldozer will heal poorly and invite problems. Myth #3: Roots grow in the soil, so adding topsoil over roots won't hurt anything. Be careful about building up the soil, especially under the drip line of trees. People often do this when leveling the ground or when adding soil for a shade garden, etc. Feeder roots are already established in the soil where water and air is adequate. Adding too much soil, even a few inches, can disturb that balance. If soil is added, it should have ample amounts of organic matter to help keep it from compacting. If it reduces air and water to those roots it could seriously affect the tree. When this happens, the damage will generally show in the tops of the tree first as limbs furthest from the roots are affected. Compacted soil can have the same affect. Soil compaction compresses the spaces within the soil reducing the amount of water and air the soil can hold. Soil can become compressed from frequent foot traffic, equipment passing back and forth, etc. Severe compaction can cause the upper most branches to die back. These symptoms may not show up for a couple years after the damage occurs making diagnosis more difficult. Clay soils compact more easily than soils higher in organic matter. On some lawns, core aeration may be needed on a yearly basis to help relieve compaction. City workers are notorious about about digging without any concerns for tree roots. Home builders are another. If the tree roots are already damaged, but the tree is stable, an application of a growth regulator can be applied in the form of a drench. Growth regulators are designed to slow canopy growth. Since the tree's energy is not going toward canopy expansion and growth, the tree will put the energy toward root growth instead. Always consult a local arborist for advice about proper diagnosis and tree care. An experienced arborist can offer suggestion about working around tree roots while causing the least damage.